The loss of a loved one is always difficult to deal with, but this problem becomes exacerbated when unexpected medical or funeral expenses need to be paid. It has become increasingly common for people to utilize memorial fundraising to bridge the financial gap so that they can focus on what truly matters. However, committing mistakes while raising money online can hinder this process. Fortunately, DonationTo provides an easy to use platform that offers payment processing and an extensive list of tools that make it possible to spread the word, including social media integration. April Neidigk was a wife and mother of two small children when she passed away unexpectedly on December 15, 2015. The 32-year-old had earned two bachelor’s degrees, and she worked at UNM Hospital. Additionally, April and her husband, Nathan, taught preschool at Calvary Lutheran Church. April’s sister, Heather Peterson, posted a memorial fundraising page a few days after April’s death. The purpose of this crowdfunding effort is to raise money online for April’s husband and young daughters. This is a very trying time for the widower as he is now fully financially responsible for his family. When you combine this with the emotional toll that the unexpected death has placed upon Nathan and his children, it becomes easy to understand how important it is to gather funding while avoiding common donation mistakes. No amount of money can ease someone’s grief, but the reality is that bills and other responsibilities do not take a break during the moments when we need a temporary reprieve from them the most. A successful fundraiser will provide some financial peace of mind and give the most closely affected family members the chance to heal instead of rushing back into the workplace. It can seem nearly impossible to come up with the right words to say after someone passes away. However, close family and friends need the solace that is provided by some kind comments. To help make this easier and to bring people outside the local area closer together, we have created a comments feature that is attached to each memorial crowdfunding page. Funerals cost an average of $10,000, and this does not take into account any medical bills or time off work that close family members need in order to begin healing after they lose a loved one. Therefore, it is essential for each campaign to steer clear of common fundraising mistakes that can impact the total amount of donations that are received before the deadline. DonationTo has helped thousands of people worldwide with their crowdfunding needs, and we are proud to offer a much-needed resource to people during such a difficult time. Our platform makes it possible to launch a page within five minutes, and you can also upload unlimited photos to help tell your story. Additionally, we have a one click sharing feature and social networking integration to help you reach out to as many people as possible. Taking advantage of all of these tools is the best ways to run a successful campaign. Failure to fully utilize all of the attention grabbing techniques at your disposal is one of the biggest donation website mistakes. No one is prepared for the untimely loss of a loved one, and financial matters can make the situation even worse. Fortunately, online memorial fundraising is a quick and easy way to reach out to people around the world. As an added bonus, it can help connect family and friends who do not live in the local area. 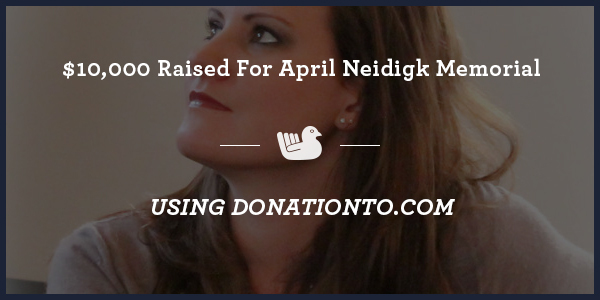 By using DonationTo, April’s sister was able to raise more than $10,000. This money will assist April’s husband and children with everything from funeral expenses to ensuring that all of the necessary bills are paid while the family has an opportunity to grieve for their loss. Fundraising video tips here: Part 1 of 32 fundraising mistakes, Part 2 of 32 fundraising mistakes, Part 3 of 32 fundraising mistakes.